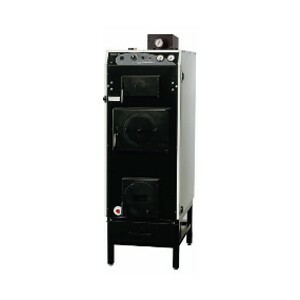 Vedolux 55 boilers work through reverse combustion with the help of a suction fan. 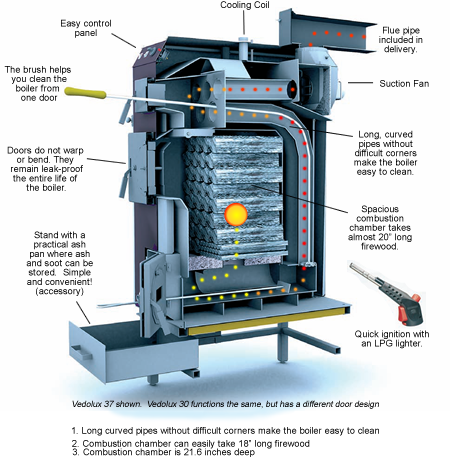 The suction fan creates the proper draft to combust firewood; therefore, the Vedolux can be installed with a chimney that does not meet height or width requirements for natural ventilation. 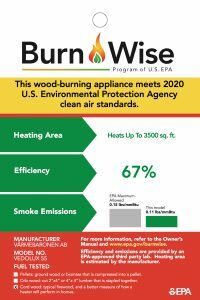 To control unnecessary heat extraction, the fan stops automatically when the fire dies. Although the unit is designed to burn primarily wood, it can be adapted for pellets by installing respective adaptors. The combustion chambers pull gases through the ceramic gates into a secondary chamber to create the gasification process. The combustion chambert is over 21-1/2″ deep and easily accepts wood up to 20″ long. When properly used and maintained the Vedolux 55 boiler burn cycle outputs approximately 190 kBTU with 87% efficiency. The Vedolux 55 should be installed with an accumulator tank. The accumulator tank stores heat for a long time reducing the frequency of filling the burn chamber. The volume of the accumulator tank(s) should be dimensioned to suit the size of the house and the output of the boiler. A minimum of 660 gallons of storage or more is to be used with the Vedolux 55. Boiler comes with an integral stand and ash drawer.